There are thousands of marijuana-themed tee-shirts circulating the United States, but I've seen the most diverse prints in Southern California because the population there isn't as uptight as other parts of the country. "Hash & Haze" is a Rap duo from Newark, NJ and medically-speaking is an extremely tranquilizing dosage of THC. 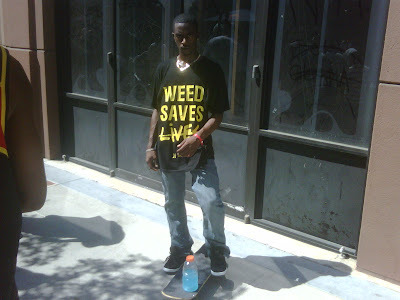 "Weed Saves," with the line drawn through the word "Lives" is remarkably bold and clever at the same time. It's like a two person design team composed of opposites, came up with it. The clever person had the entire phrase "Weed Saves Lives" ready to print, and called the bold person to check it out. The bold person saw it, drew a line through it and said, "Now you're saying something," and they decided to smoke a bowl as a reward for their accomplishment. They forgot to remove "Lives" with the line drawn through it and submitted it to the production department. That's how this dope tee was born--at least that's my guess. Growing up I never liked the ampersand. 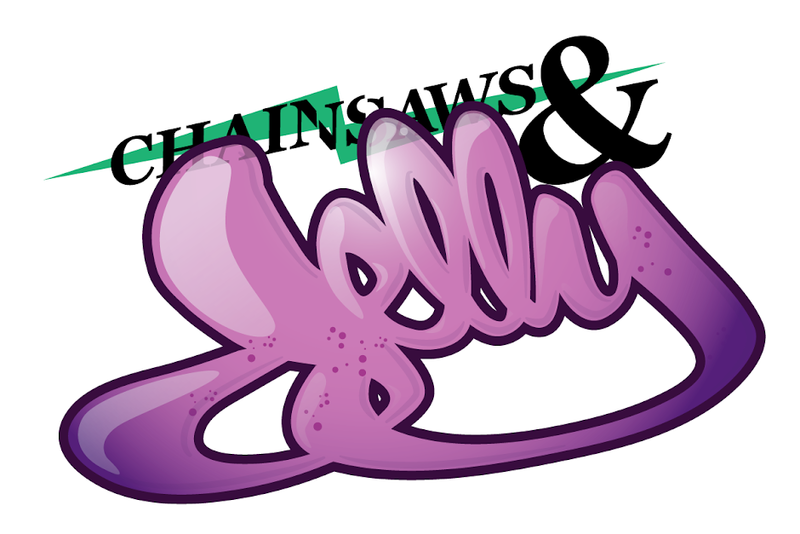 I saw it as a kid in the "A&P" supermarket logo when I'd walk my grandma to the Ivy Hill Plaza, and it confused me then because it meant "and," but I couldn't understand why they couldn't neatly use a lowercase and smaller font for an extra three letters. I didn't understand the simplicity of the layout at the time. Plus I couldn't write an ampersand longhand, so that frustrated me as well. I definitely didn't like the ampersand until I saw the Florida Gators NCAA Basketball starting five Championship team tee in the mid 2000's. I liked it because it was a neat way to represent all five players' first names without constantly reading the word "and." From then on there have been hundreds of tees with four ampersands and five words, but this one's by far my favorite. The word "Zones" is funny. People don't say that very much in New Jersey. 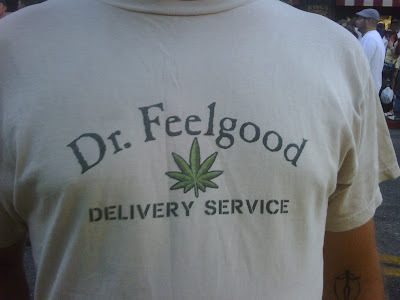 Dr Feelgood Delivery Service is pretty much a boring-looking design but maybe it's just the shirt color that's kind of lame? A black tee shirt with the font in white and the leaf staying the same shade of green is a just as nice a display. I'd wear this tan shirt just fine though. 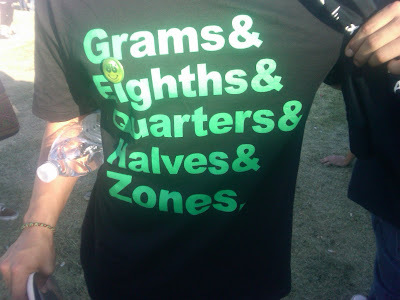 I love geography probably as much as I love marijuana and this shirt is representative of both. 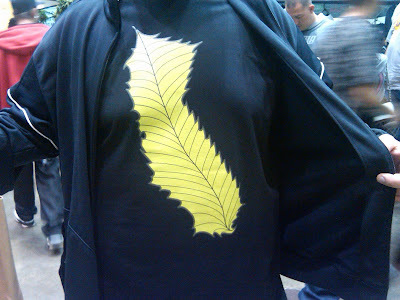 I'm not from California, but if I was I'd wear this shirt illustrating what a leafy state it is. This is the kind of shirt I like because only a certain demographic understands it. I'm all for marijuana and everything, but wearing it on your clothes? Ugh... "420 culture" just kills me.